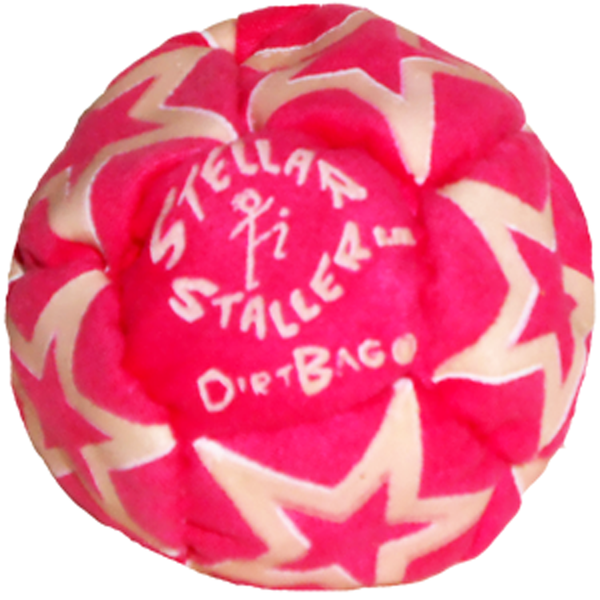 The Dirtbag® “Stellar Staller” footbag breaks new ground. 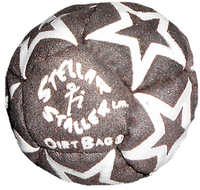 Combining sand, plastic pellets and steel pellets for the filler material, it is also our first Dirtbag® to GLOW IN THE DARK! It kicks like a dream even after the daylight is gone. 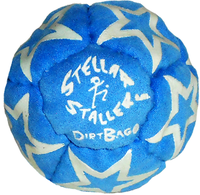 Get your Stellar Staller instead of kicking under that street light like we have all done one time or another. 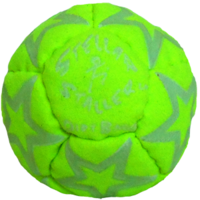 A brilliant classic green glow that actually glows purple under a black light is light activated making it low tech and dependable, no batteries and no lop-sided kicking. this dirt bag is beyond perfect, the stall is obviously quality. and the pop/bounce is very loft like. Bought the sand filled one and it was perfect. It has just the right amount of sand in it so it doesnt go lop-sided when you give it a glancing hit. Despite this it is still easy to stall, plus it stands up to heavy use and was still working fine 5 months later until I lost it. 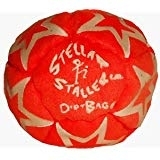 Im ordering another one now and thought I'd review it to help anyone else looking for a good hackey sack. Would buy for a third time if I manage to lose the second one! i think this is the best staller for a person just starting out - buy it! i did not expect the great pop and overly met my expectations of a metal mix bag and the weight is on the heavier side but makes the control that much easier. this hack is awesome. 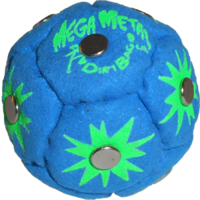 It's a good size to help you with accuracy but it's definitely heavy enough to play in a group and keep centered. The glow in the dark stars are awesome. I got mine in three days even on Memorial weekend. I would recommend this foot-bag to a friend. Do not be fooled by the picture though, the sack is indeed black but the star & logo decor is actually a pale yellow-green. It hurts a little when playing bare foot but you get used to it. It glows in the dark awesomely! Make sure to clean this foot-bag properly because the star outlining has begun to crack on mine(I think it's because I didn't clean it as often as I should have). 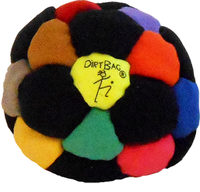 This footbag is easily the nicest I've owned. 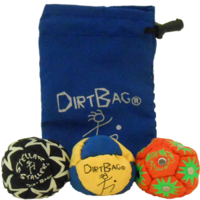 It's made from high-quality materials and has a substantial weight to it, so unlike sand-filled sacks, it's just as good for a "hacking circle" as it is for individual free-styling. 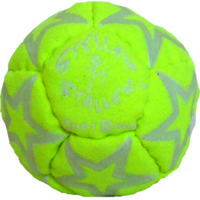 Best of all, the glow-in-the-dark detailing practically BURNS with light, so you really can hack at night! 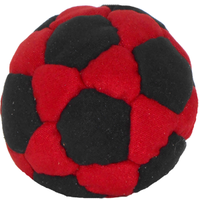 this hacky sack is sick. i got mine and i love it. 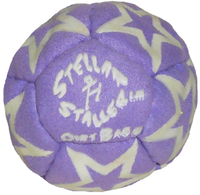 the stalls are really easy and now i can hacky sack at night too. thank you dirtbags for making this. couldn't be happier with the bag. they've really hit their mark with this one. 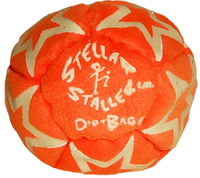 I totally dig my Stellar Staller. Great feel and solid play. Doesn't feel like im kicking air when i play it. Supple and responsive on my feet for that stall action we all dig. 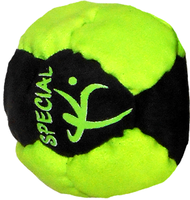 you will enjoy this footbag! i couldn't be more pleased with this bag. great shipping only sweetens the deal.